Wheelbase (inches) Length between the front and back wheels of the longboard skateboards. 24"-31"
The Whip 44" is the Middle child of the 2018 Whip family of Dancing and Freestyle decks from Rayne Longboards. This board is longer for those riders looking to throw some cross stepping moves or dancing while they roll to uni. 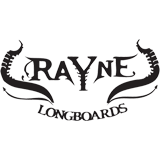 Rayne Longboards are one of the prime longboard companies in the world, making decks with the ultimate technology to be super strong, functional and super light. This Whip 44" is a long deck for dancing, cross stepping and freestyling. 9.45" width is stable and comfortable and with a mellow rocker for easy turning and guiding your feet in the right position. A new level for freestyle, flip tricks and quick, nimble footwork with a firm flex for a comfort riding on any style and perfect to get use to for those learning to ride. Due to this versatile size this deck could also be used for freeride and mellow downhill. A perfect do-everything board and is comfortable for seasoned riders and beginners alike. Triaxial Fiberglass – Reinforces the bamboo and creates a board that is extremely light, durable, that will never sag or loose life. Fiberglass construction gives the kicktails tons of pop, making freestyle moves easy because the board will react to your every command. Vert-Lam Bamboo Core –Bamboo is stronger than steel yet lighter than traditional hardwoods. Sublimated Artwork – Scratch-resistant ink is tattooed into the deck on both sides! Round Edges – Edges are rounded to prevent damage to the deck and the rider. Medium Firm Flex– Made for riders between 130lb and 220lbs. Twin Shape – Ride it anyway you want! Rocker – Pre-loads your legs for easier turning. Micro Drop Platform – Very subtle platform drops from Zero Degree mounting into the rockered platform. Provides easy footing reference to know where your feet are but won’t get in the way of cross steps or any other moves. 3D WheelWells– We mill out layers of the core before pressing and then press the wheelwells into the bottom sheet giving your board extra durability, superior water protection and long life. Leverage Concave – Concave that has a narrow flat center and turns up at the ball of your toes in an even linear lever concave. Universal Variable Top Mounting – Lets you pick the wheelbase that works best for you and your truck/wheel setup. Not all trucks have the same design. Multiple wheelbases allow you to customize your placement to optimize stability, turning and getting the perfect amount of pop from the tail. Bee Orange Finish – Smells good, taste great, and seals and protects your board without harmful chemicals.